To give a great speech, you have to plan and practice; with the right preparation your audience will leave informed, enlightened and inspired. 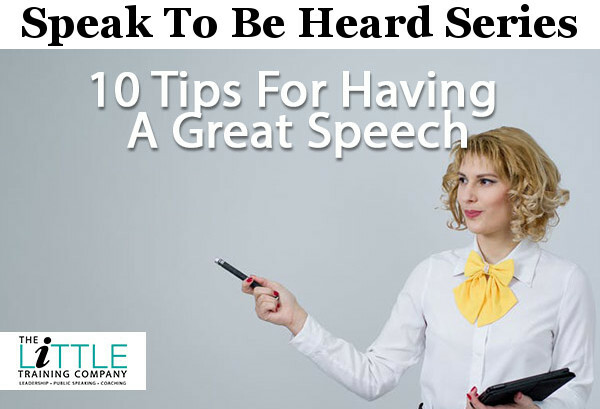 Here are 10 tips to have a great speech; get ready for your next event to be spectacular. While human beings seem to universally enjoy visual stimulation, don’t rely on props to make your talk interesting. If your fear of public speaking is compounded by or created by a fear of tech glitches, ditch the PowerPoint presentation you’ve been angst-ing over, and instead hand out Worksheets or Checklists—something tangible and helpful they can physically take away with them. Handing them out before the presentation and asking people to refer to certain portions of your handout is a low-tech way to create engagement and interaction… but if you prefer to hand them out afterwards, invite people to take notes but let them know you’ll have a ‘takeaway’ handout, so they can focus on and enjoy the speech. It’s just like writing an article. You want to ‘hook’ your audience members straight away. Yes, by all means warm up the room a little, if you’re the only presenter and people are still filtering in, but once you start your presentation—grab ΄em by the collar and don’t let ‘em go! Finding the right question—one that they urgently want the answer to and have perhaps been asking themselves—is a powerful way to get your audience’s attention. Telling a quick story or anecdote is also a great way to engage their emotions. These are two powerhouse techniques that you can easily build into any speech or presentation; so use them! No, you’re not giving a ‘lecture’ (no matter what the organizers want to call it): What you’re doing is interacting with a large bunch of like-minded people. Let them know you are human. Tell mini-anecdotes to illustrate points. Help them to identify with situations and solutions you talk about. You want it to feel more like a conversation than a ‘lecture’. Do that, and it will help them to identify and connect with you in a more powerful way. It’s important to use props and tools that work for you—not cause more stress and fear. If technology scares the socks off you, either go low-tech or take along someone to manage that slide show for you. If you like using whiteboards, use one… even if all the other presenters are going with screen sharing and slide presentations. The important thing is not the fancy bells and whistles you’re using: It’s the story you are telling and the point you are trying to get across! It’s a simple tip, but almost every expert in public speaking will tell you that smiling before and after you go ‘onstage’ (or live, online) can help relax you, as well as create a connection with your audience. So make sure you walk on with a smile. When you smile at someone you almost always get a smile back. It relays warmth and openness, exactly what you want to get back from the audience. A good speaker will vary their pace; speeding up through information that isn’t important and slowing down when they convey something they really want the audience to get. Varying the pace also helps to keep the audiences attention so they don’t drift off. If however, you normally have a reputation as a fast talker, work on deliberately slowing down when you give presentations. If you know you tend to talk too slowly (or you’ve noticed this, when you play back recordings of yourself speaking), then make a conscious effort speed up to a faster pace. Your delivery should be energizing but clear. Keep practicing, record yourself while you practice—and play back, to note any improvement. Keep at it till you don’t put yourself to sleep or make your own mind wander! Experienced speakers have a secret weapon—the Pause. There can be all types of pauses for all types of reasons. A pause to make people sit up and recall their wandering attention; a pause to create suspense or anticipation; a pause to ‘cue’ your audience that you’re about to say something important. Think about it: If you read page after page of heavy text, with no paragraph breaks, your eyes would soon grow tired and you’d give up, bored. It’s the same with listening to presentations. Your pauses are the “white space” that helps people keep focused on what you want them to focus on—the points that are important between the ‘spaces’. So use your pauses wisely, and make them work for you. Not only for hydrating you while you are dealing with a mid-speech dry mouth, but as a handy cover-up when your mind goes blank. Usually, you will find that the pause you take to sip your water not only looks natural but allows you to figure out ‘what happens next’ and get back into your stride—but keep it away from electronics! Tip: Hydrating for a day or two before you presentation will help prevent dry mouth. Enlist people who arrive early for your workshop as volunteers. 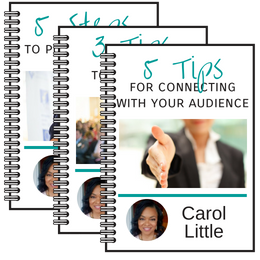 Get them to hand out your follow up sheets as soon as you inform your audience that you’ll be giving them sheets you’d appreciate if they’d fill out at the end of your presentation. Water is your best friend, if you are using it to prevent a dry mouth. Avoid milk—it causes mucus. Avoid carbonated drinks that make you burp. Don’t drink orange juice: Some people actually find it creates more mucus than milk.